IMAGIS is a geographic information system available everywhere 24/7. It is a comprehensive GIS application used by many utility companies in their daily work. IMAGIS is a geographic information system available everywhere 24/7. IMAGIS is more then yet another zooming and panning application (YAZAPA) of spatial data, its possibilities are far more serious. It is a comprehensive GIS application used by many utility companies in their daily work. 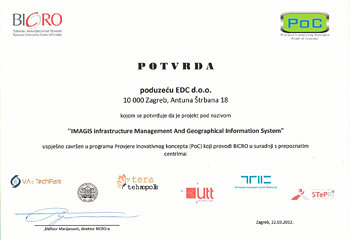 EDC is the author and owner of IMAGIS system which is primarily intended for geographic information systems, utility companies and local authorities. 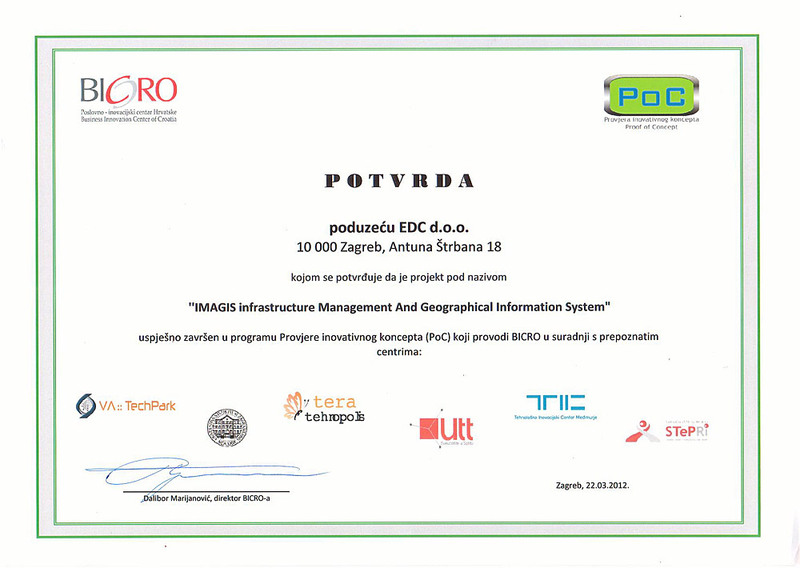 Thanks to its structure and mode, IMAGIS is an ideal solution for any geographic information system. EDC can arrange IMAGIS hosting, data maintenance and storage, GIS project development, specific modules and all other services related to IMAGIS. IMAGIS is a WebGIS application, which means it is available on every computer that is connected to a company’s computer network via intranet. Users can access IMAGIS through their normal web browsers, such as Internet Explorer, Firefox, Chrome. Speed of the processor and computer’s operating system won’t affect the IMAGIS quality. Number of IMAGIS users is not limited, neither technically nor financial, meaning there is no fee for the number of licenses. User’s location is not a barrier to the usage of IMAGIS. If IMGIS is operating on intranet system, then user’s computer has access to the intranet network. If world wide access is needed, then IMAGIS server opens www and limits the IMAGIS access with a password. IMAGIS server can be stored on one of EDC’s servers or on the client’s server. Map view and search: pan, zoom in/out, default scale, turning layers on/off automatically, quick display of raster layers. Dynamic legend and attribute information, position and map location. Measurement: measuring points (HDKS 5 coordinates), length, perimeters and areas. It can be plotted as well. Locating: Quick locating, based on user-friendly menus and drop down list. Data search: analyzing objects based on SQL queries. Object statistics: Creating statistic report for the selected objects. Spatial analysis: Selecting one theme objects based on another theme. Linking with external data: each object can have a link to images, drawings and other documents referred to via hyperlinks. The possibility of establishing archive of documents. Table report of the selected objects. Map theme: Creating customized thematic maps. IMAGIS data are securely stored on server. Backup and no redundancy are provided in that way. In every GIS system, spatial data are its vital and most valuable part. Collecting data takes time and money. GIS data maintenance includes import/export, editing and deleting spatial data geometry and properties. During spatial data maintenance it is possible to use snap for precise positioning. When editing spatial data properties (attributes) it’s possible to use pre-defined values (drop down list). You can also edit more objects at a same time. Next step in GIS data maintenance is control, IMAGIS has topological and attribute controls which secure data consistency. In every moment it is possible to design GIS analysis via SQL and spatial data analysis. GIS administrator is the one who deals with IMAGIS data input and maintenance. Administrator also has access to the interface which is password protected. EDC has vast experience in spatial data design and maintenance, from field surveys to designing IMAGIS database, especially in the area of utility applications. One of IMAGIS unique features is its association with AutoCAD. AutoCAD is a defacto standard for designing technical documentation. You will get each geodetic survey, each project and each spatial data in DWG format. As an AutoDesk developer, EDC has developed IMAGIS based on MapGuide server which is Autodesk Open Source GIS. IMAGIS is a logical extension of your AutoCAD to spatial data and GIS. Apart from IMAGIS interface, users can maintain and improve their GIS using only AutoCAD Map (AutoCAD upgrade) or together with IMAGIS. Such GIS system is undoubtedly the most cost-effective GIS for technical systems. IMAGIS contains ready-made modules applicable to most utility systems. These modules are fully compatible with each other, therefore GIS for water supply, drainage and lightning can completely be used within the same user interface – IMAGIS website. Module for recording and analyzing system interventions (with work orders and reports). And many other software modules development under the project implementation.